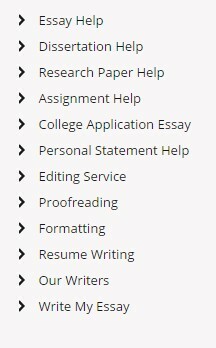 “Who Can Write My Essay?” Hire Your Writer Today! Can I Really Get My Essay Written by Professional Writers? Meeting the requirements of your teacher. Helping you to learn something about academic writing and the particular topic throughout the completion of your order. Once we achieve these two goals, the satisfaction of our customers follows naturally. Choose Your Writer and Get the Best Results! The most important feature that sets NinjaEssays apart from other services is the ability to choose your writer. You’ll provide your instructions and you’ll see the profiles of the authors who bid on your project. Then, you’ll choose the most suitable applicant! Our writers will adhere to your professor’s instructions. However, they will do something more: they will craft content based on critical thinking, creative ideas, and reliable academic and scientific resources You can use the chat feature to communicate with your writer throughout the process, so you’ll make sure the assignment is being developed in the right direction. Can your writers complete my project? That’s a question we often get. The answer is: of course they can! It doesn’t matter what area of study your paper belongs to and how challenging its topic is; we have hired authors with knowledge and expertise in several areas of study. 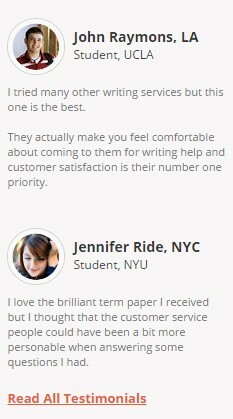 The best thing about our service is that you see the rankings our writers got from previous customers. When the rating is combined with information about their education and interests, you get a clear reflection of their capacity. «NinjaEssays» reviewed by Maria A. on January 15, 2016 . NinjaEssays is the service I always recommend to my friends. I always get what I need. It doesn’t matter what course I’m struggling with - I just provide my instructions, pick a writer and enjoy the free time I get. The results are always outstanding. «NinjaEssays» reviewed by Richard T. on January 23, 2016 . I’m glad I found this service. It’s cheaper, but more reliable than the ones I used before. I loved the option to choose my writer. The quality of my essay is great. No matter how hard you try to write all papers your professors assign, sometimes it’s simply impossible to meet the standards. Don’t worry; NinjaEssays is always here to support you. Our guarantees speak for themselves: all customers get the service they pay for. 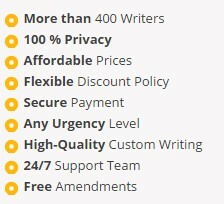 We offer unique features that make us the best choice in the custom-writing industry. Don’t hesitate to hire our writers for writing, editing, formatting or proofreading services regardless of the project you need to submit! The payment processing system at our website is as safe as it gets. Once you submit your order, you’ll start collaborating with the author you choose. Your writer will complete unique content according to your instructions, and then you’ll be able to submit your feedback. Due to the fact that you get a chance to chat and collaborate with your writer, we boost your chances of getting the quality you need. What Will You Get When You Place an Order? You’ll get a chance to choose your writer! You will receive 100% plagiarism-free essay crafted in accordance with your instructions. You’ll get a chance to collaborate with your author at any stage of the completion process. If you get any ideas after submitting the initial instructions, you can easily send them to the writer. You will get a fair price. Our offers are much more affordable when you compare them to other services, but the quality we deliver is higher! You will receive the completed paper by the deadline. We guarantee to deliver all orders right on time! Our essay writing assistance is mainly focused on delivering the content students need, but we also care for their academic progress. That’s why we do our best to turn each and every order into a learning experience. You’ll certainly boost your own writing skills when you see our authors in action! If you need more information about our services, feel free to contact our customer support representatives at any time.